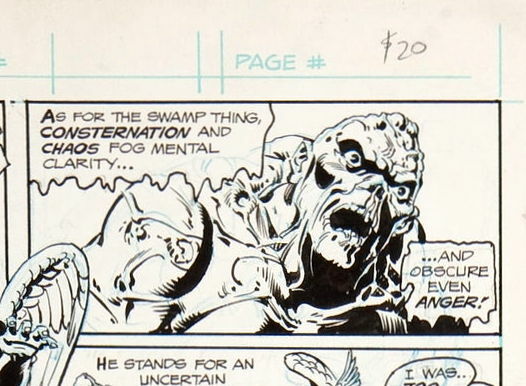 So let’s take another look at those unpublished Swamp Thing pages. …and that the transition from man to muck is apparently not under Holland’s control. 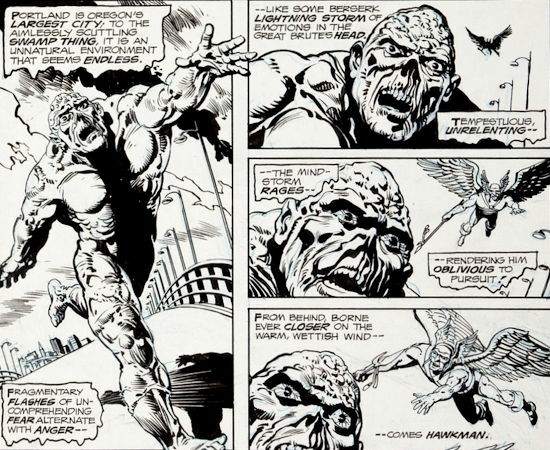 So in a way, I guess that ol’ Man-Thing lettercol crack about Swamp Thing being “Hulklike” is…um, I guess sorta accurate in this case. Now, whether this is just a one-time thing, a shocked response to Alec suddenly becoming Swamp Thing again after his cure in issue #23, or whether this was a situation that Alec would eventually gain some control over in subsequent issues…the world may never know. …ranging from $15 to $20. AAAAAUGH…those are prices even I could afford! …I suspect they’ll probably go for a bit more than that in that auction. …Hey, you guys know my birthday is coming up in just about a month and a half, right? For some reason I find the “Portland is Oregon’s *largest city*” caption very amusing. It sort of implies that if Swampie had turned up in Eugene, he’d just be walking along the street saying ‘Hi’ to folk. I’m just glad nothing in Swamp Thing #25 contradicts the events in Challenger of The Unknown #83. They fit perfectly together, with the temporary Swamp Thing transformations seen here foreshadowing the permanent one, in which Alec goes out his way to save the Challs and remains stuck as Swampy for good. Of course, Hawkman would have to make a follow-up appearance in ST #26 to get out his own jam here, before moving on to his next JLA appearance. I don’t want to think about the wind making Hawkman warm and wet. Crawled out of the Willamette…. *ick* If it was after a heavy rainstorm there would be the usual sewage run off. That would mae me Hulk like crazy too. Doesn’t it just figure?! I go away on vacation for a week and return to find that Rich has finally dropped his news.I expected a bit of script or unfinished art.How cool is it to see actual pages?I’m blown away!Thank-you Mike,Rich and the internet itself for making this possible. Yes, the internet has had its ups and downs. I reached out to David Kraft last night. I’ll post on my site if I hear back from him. Not counting this lost issue, DC has released its 250th regular issue of Swamp Thing in 40 years since this week! Wow!